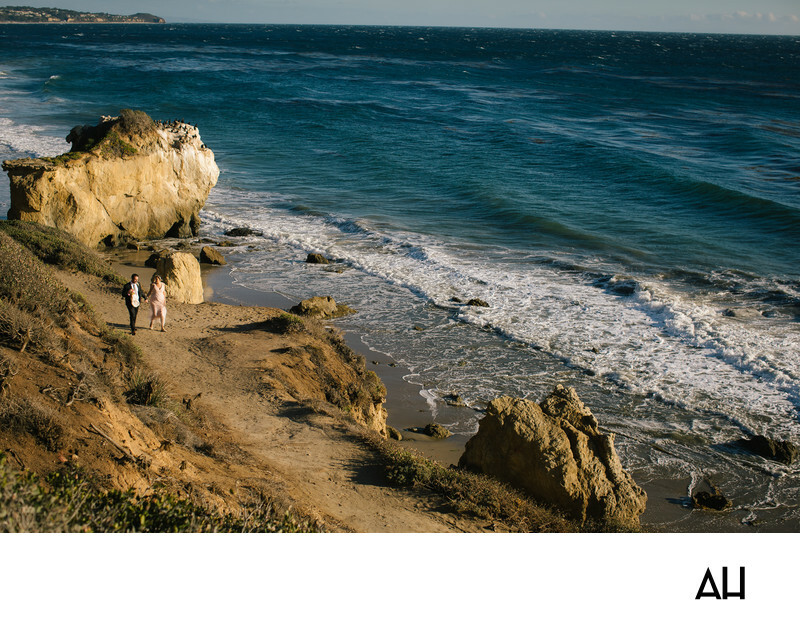 Beach Weddings in Malibu are perfect for couples who want a day filled with sun and sand. This image from a Malibu wedding shows the bride and groom strolling along the shore, with the Pacific Ocean stretching out wide to their left. The scene is like a picture from a California postcard. Beyond the deep teal color of the ocean, the hazy blue sky greets the sea at the horizon line. It is symbolic of the big bright future the couple has before them as they begin the journey of their marriage. The bride and groom walk casually along the shoreline, hand in hand, with smiles imprinted on their faces. They walk without purpose, without a care, simply enjoying the time that they are spending in one another’s company. The atmosphere of the picture is tranquil, and the comfort the bride and groom feel in the presence of each other is apparent even from a distance. The groom’s black suit jacket hangs opens, revealing his now untucked dress shirt and showing the laid back nature of this moment. He holds the bouquet in his hand so that the bride is free to hold his hand and the skirt of her wedding gown. Her dress blows about in the breeze that brushes over them from the sea, kissing their skin with fresh salty air. The bride looks at the groom adoringly as he chats with her about the events of the day. It is an ordinary moment shared by the newlyweds on an extraordinary day.